“What am I doing here?” That’s what I asked myself seven years ago, about a day into my first NAB show. NAB is the annual gathering in Las Vegas of the National Association of Broadcasters. 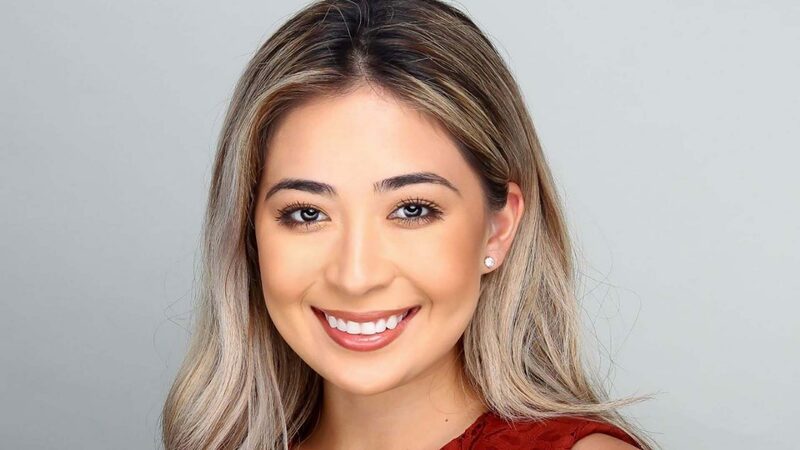 At the time, I was a Digital Director for a local NBC affiliate, and was part of a cohort of 25 digitally-focused leaders invited by NAB in an effort to update and diversify the content of the traditionally TV-focused conference to be more multiplatform. The NAB show still features a mind-numbing sprawl of video cameras and booms and rigs, enough to overwhelm even the most rabid broadcast engineer. But NAB has truly evolved to become a gathering that now represents the present and future of media: The major platform companies including Google and Facebook, the cellular companies at the bleeding edge of 5G, the ‘television’ companies powering ATSC 3.0 and addressable TVs; not to mention car companies, who recognize the potential for autonomous vehicles to transform the car into a mobile media center; and rows and rows of digital disruptors. At a conference so vast, everyone has their own specific experiences and takeaways. 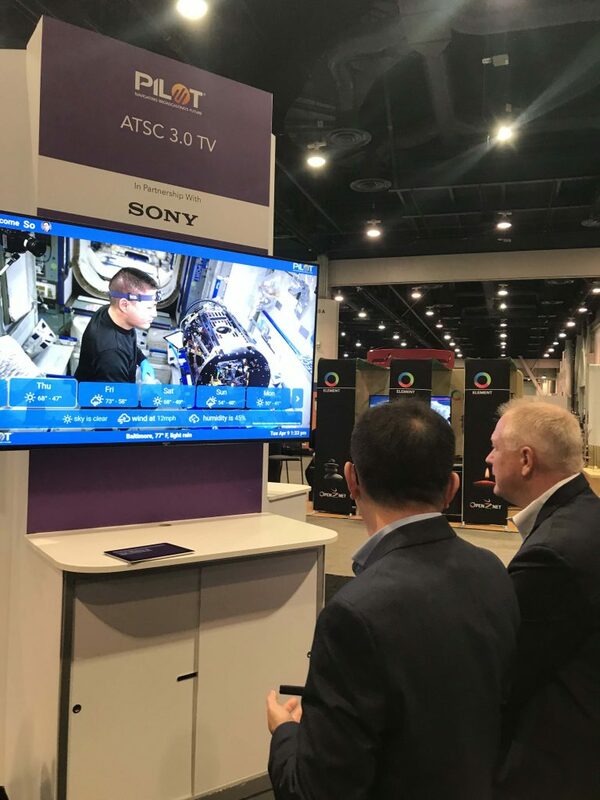 Here are five things I’m bringing back as insights from this year’s 2019 NAB Show. There was a time when newspapers printed words on paper, TV stations did newscasts, and radio stations broadcast over the airwaves. The ‘swim lanes’ separating media are officially gone. At NAB, there were countless examples of radio shows broadcast and streamed as ‘TV’; successful podcasts from TV news stations (several have been featured here in the Cronkite News Lab); and then there is the announcement by the New York Times of its imminent launch on Hulu and broadcast of its TV show The Weekly. In this new world, the silos are fading. For sure there are specialists. But the momentum is toward being a media company, creating content for all platforms. It makes sense. Think of how we behave as consumers. Over the course of a day, we move seamlessly from device to device based on what’s convenient for us. Consumers don’t have those swim lanes, and adaptive media companies are leaning in to meet the consumers where they are. I’ve been watching demos and following addressable-TV developments and ATSC 3.0 panels for years. The demo I saw from SONY TV this year was different. We are finally at the tipping point where local broadcasters are going to be able to implement both content and ad strategies that deliver location-specific content within their markets. A “local” newscast for a DMA could have a first block of stories chosen for relevance across the viewing area; and then subsequent news blocks could be geo-targeted to be specifically relevant to targeted counties; weather forecast and other data streams can be presented as overlays based on zip code. Ads can also be geo-targeted. This technology opens up much better hyperlocal coverage opportunities; and it also will create new workflow and staffing challenges as local news organizations will need to figure out how to create these multiple additional geo-targeted content streams. An “Addressable TV” at NAB. There is only so much time in the day. So there is only so much time for consuming media. Any new media format typically “wins” by taking share from a previous media habit, e.g. print readers migrating to online. The exception is when a technology creates ‘found time’ that wasn’t previously available for media consumption. Podcasts have grown in part because users can turn ‘down time’ into ‘media time.’ There’s no better example than the smartphone, as we know from the parade of people walking around with their heads buried in their phones. 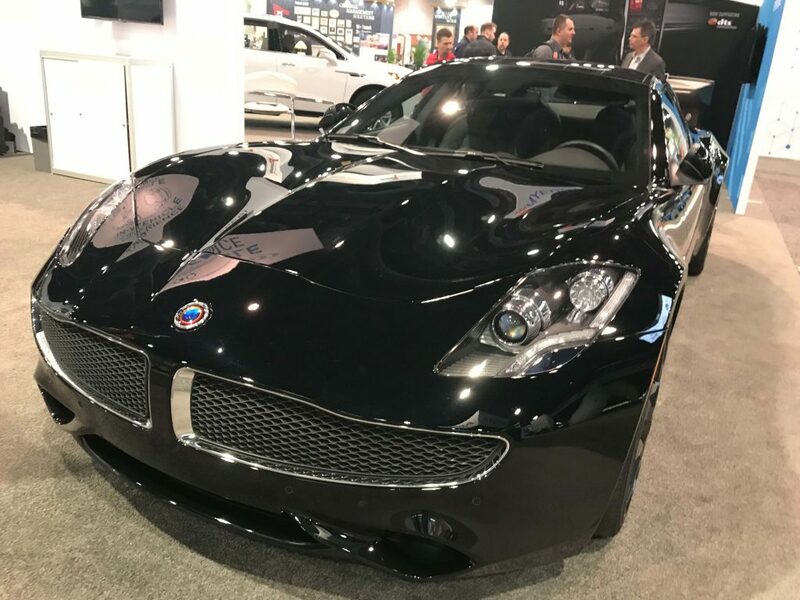 A concept car at NAB. The car is the next great media battleground for ‘found time.’ Today, the car is a place for listening and talking. Podcasts are a great media match for the attention requirements of driving. But as we move inexorably toward autonomous vehicles, all kinds of media consumption become possible for passive car travel. This ‘found time’ for consuming rich media via screens in cars creates an entirely new opportunity to connect with consumers. Media companies are already thinking about how to win on this new screen. Equally important will be to solve for seamless screen transitions. Media companies focused on their customer will need to insure that users watching a video or listening to a podcast before getting into a car can transition to the car’s media system and smartly ‘resume’ at the point where they left off. It’s not too soon for local news organizations to be asking: How might I design content to be consumed in cars? 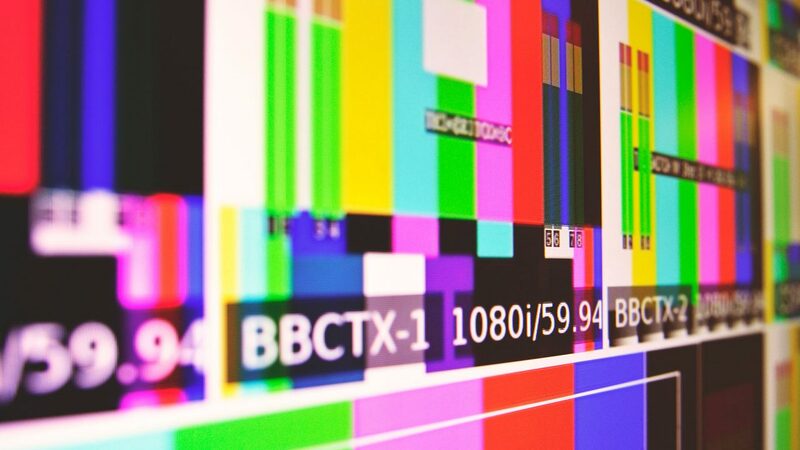 A recent article in the Nieman Lab fairly called out broadcasters as a group, comparing the degree of collaboration to others in the media ecosystem. At NAB, I saw countless examples of “one plus one equals three” synergy, where content companies and technology companies join forces, leveraging the core competencies of each to combine to make something that’s a win for both. It makes sense that, in this fast-changing and digitally-disrupted world, we can’t go it alone. 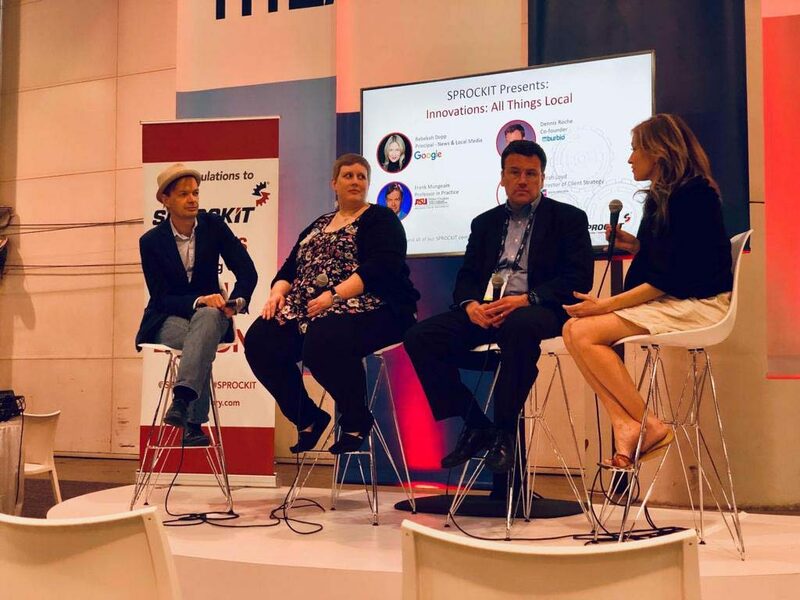 At both the SPROCKIT Start-up Hub and the NAB Pilot innovation hub, I saw examples where digital technology is enabling and enhancing the core journalism mission of local broadcasters to inform and engage with their communities. I moderated a panel where two corporate leaders extolled the virtues of these collaborations, and the kinds of opportunities broadcasters should be looking for. Bruce Antley at Verizon described the benefit Verizon gets by partnering with start-ups that can solve problems too small for his company to focus on. Antley, who is head of strategy and innovation planning in the new business incubator at Verizon, noted that startups can be more agile and can enable large media companies to get useful tools faster. (From left: Frank Mungeam, Sarah Lloyd, Rebekah Dopp, and Dennis Roche. Photo by Tony Shepherd/Social News Desk). The key is understanding what problems you’re trying to solve, noted John Buerglar who is SVP for growth initiatives at Univision. A good start-up partner will listen to its media partner and co-create a solution faster and better than a large company, with its inevitable layers, can do on its own. The advice to media companies: Identify problems relevant to your business but ones that you’ll be too slow or too poorly equipped to tackle yourself, and look for a partner who can help you both win. NAB is the ultimate buffet of tools and technology. But one theme was clear. It doesn’t matter how many tools you have, or how much cool technology you add to your operation. What matters is – how well is it adopted, and how well is it applied to advance your journalism and business goals? I moderated a panel on innovation where that point was driven home. Sarah Lloyd, Sr. Customer Success Manager at Social News Desk, a social content management system widely adopted by broadcasters, talked about the crucial role of ongoing training for news organizations to keep current on best practices. Adoption – are people really using the tool, and fully leveraging its capabilities – should be the metric, rather than treating the rollout as the project completion. Likewise, Rebekah Dopp on Google’s Global Partnerships team talked about the vast resources available to journalists via the Google News Lab. That self-serve portal has value to the extent that newsrooms access it. Google’s approach is to develop practical case studies demonstrating how to use its tools to enhance journalism. Ultimately, I go home reminded that the future of media is complex, exciting, and scary. The emerging tools and technologies are dazzling and overwhelming. But at the end of the day, our core competency is content. And if content is still king, the queen is surely technology. Prospering in this fast-changing ecosystem will require the best of both.